Casual doesn't mean dressed-down. It means comfort that feels fabulous and makes your living room a welcoming place for you and your family. 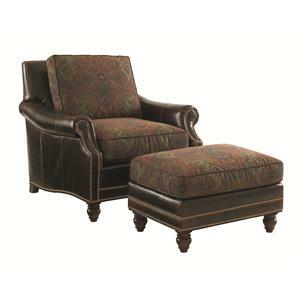 The Shoal Creek chair provides just that, the plush comfort and sophisticated, traditional look you desire. Cushions filled with duck down and blended polyester fiber softly hug your form as you relax. 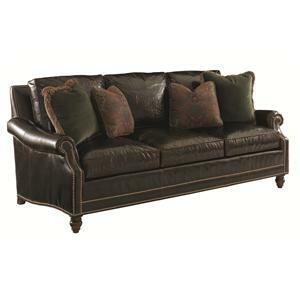 Dressing up this comfortable piece are traditional rolled arms, and nailhead studs along the arm and back border. Elegant turned wood legs complete the look. 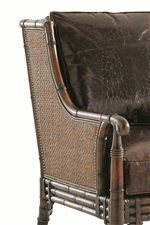 The Landara Shoal Creek Chair with Turned Legs and Nailhead Border by Tommy Bahama Home at Hudson's Furniture in the Tampa, St Petersburg, Orlando, Ormond Beach & Sarasota Florida area. Product availability may vary. Contact us for the most current availability on this product. 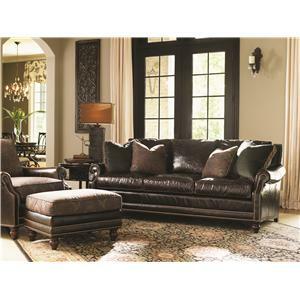 Fabric Options Custom upholstery may be completed in a wide array of fabric choices. Frame Construction Layered hardwood pieces are criss-crossed to create hardwood blanks with strength and rigidity. Corners are glued, screwed, and corner blocked for the best reinforcement. All joints are double-doweled. Exposed wood parts are made of solid wood which will take the custom finish and highlight the grain character of the wood. Natural beauty and the wonders of civilization move you to travel the world. You never sit still, because the sense of awe you feel while experiencing new cultures and landscapes constantly draws you. Whether off on an African safari or the stunning white sand beaches of the West Indies, your life's journey is to see and do it all. When you come home again, you want surroundings that remind you of all the things you've done and mesmerizing places you've been. Your home is undeniably a Landara home. 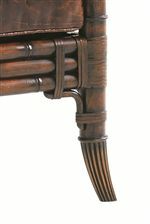 The Landara home collection was Inspired by refined destination travel resorts and features rich and opulent design accents like woven raffia, crushed bamboo, and stunning rosewood veneers. Borrowing from the style of British Campaign furniture, Landara displays beautifully sculpted antique brass hardware and leather strap detailing. From ornately shaped, tropical dining tables to the soaring rattan poster bed, each piece is characterized by distinctive luxury and a subtly exotic feel. Versatile pieces run the gamut from handy storage chests to accent chairs that can fit perfectly into many different room settings. The Landara collection also offers a wide selection of custom fabric upholstery pieces, imbuing your home with relaxation and comfort in addition to breathtaking style. From the ends of the earth to the warm embrace of home, Landara offers the perfect blend of wide-eyed wonder and welcoming comfort. The Landara collection is a great option if you are looking for Tropical furniture in the Tampa, St Petersburg, Orlando, Ormond Beach & Sarasota Florida area. Browse other items in the Landara collection from Hudson's Furniture in the Tampa, St Petersburg, Orlando, Ormond Beach & Sarasota Florida area.